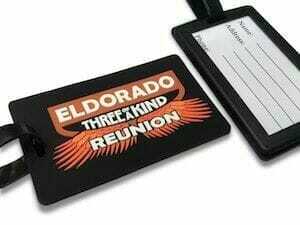 Custom rubber luggage tags are made to order with your design or logo. They can be made with an identification card slot on the back or with a writable surface. Travel a lot? Never lose your suitcase again with custom PVC luggage tags. Manufacturers have understood and long held the market for creating things like luggage tags, zipper pulls, and magnets out of PVC rubber. The versatility of this material makes it a durable and highly designable resource for making what is fast becoming an identity piece - the PVC luggage tag. Custom PVC rubber is lightweight and flexible. Each luggage tag is custom molded and made of PV, a vinyl polymer. Color and shapes are unlimited in variety and they are durable which makes them popular. Specially made PVC luggage tags are great gifts that companies are beginning to give out at holidays and also as a token of appreciation for staff. Luggage tags are great for building your brand. People are more inclined to remember the name of your company and the goods or services you provide then they have been gifted something useful or fun. Your customers will see your logo and will associate it with the positive experience that was being gifted an item. And they will remember you when they are pursuing your products or services. Having your brand, logo, or business name on everyday items increases your exposure and expands your reach. Not only will the people brandishing your gear be reminded of your business, but the people with whom they interact will also be exposed. Your business will be imprinted in people’s minds, which is the surest way to generate new and maintain existing clientele. Rarely do people expect this gift, but imagine a stylish PVC luggage tag, in a custom color and design that not only looks great on your luggage but also helps in finding your suitcase at baggage claim! No more colored tape. Imagine attending your next company holiday party and being given custom-made luggage tags that add luxury and personalization to your travel gear? Now that's creative... and useful! PVC Luggage Tags are an excellent way to promote your company as you travel. The Monterey Company provides a luggage tag with a back that contains the standard slip-in identification card or holds a standard business card. A vinyl strap is included for attaching to your luggage or other items. PVC luggage tags mean traveling in style with no lost bags. With all the promotional gifts being given out each year at, the Luggage Tag is really one unique and underused idea, that is available and functional for the recipient of the gift. Made out of PVC, they are an excellent way to promote the company as you or others travel. The back contains the standard slip in identification card and is also the perfect size to hold a business card. There is a vinyl strap that is included for attaching to your luggage or other items. PVC custom luggage tags made in days! Our most popular luggage tag is made of PVC. Soft and flexible, PVC luggage tags can be made in almost any color. Colors are generally separated by a very tiny gap. 3D effects can be added to best represent your logo. 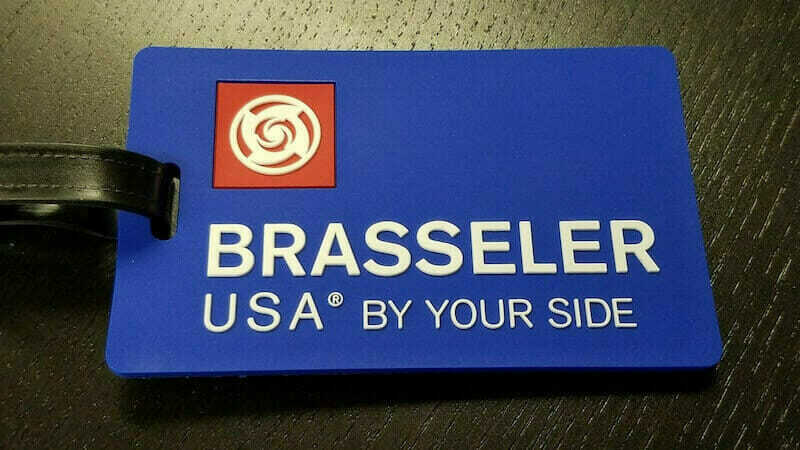 The Monterey Company can make custom shaped luggage tags and match any company color you may have. Feel free to request a free quote and we will send you a design for your review and approval. © Copyright 2019, All Rights Reserved, Monterey Company, Inc.